Royal Caribbean is planning on sending a record amount of its ships to Europe for the 2012 cruise season, which constitutes more than half of its fleet. 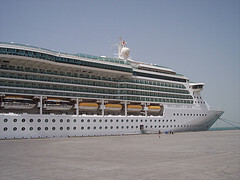 The cruise line announced 12 of its 22 ships will be serving European itineraries in 2012 as demand in the region is expected to continue growing. 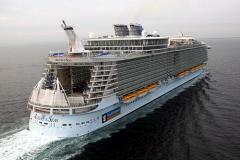 By sending 12 ships in 2012, it will increase Royal Caribbean's presence in the continent from 11 in 2011 and 8 in 2010. Royal Caribbean has decided to end port of calls in Barbados after moving Serenade of the Seas to Europe for the Summer 2012 cruise season. The move has upset Caribbean officials, namely the Caribbean Tourism Organization (CTO), which has expressed concern about the loss. CTO Secretary General Hugh Riley said they are aware that repositioning is a normal course of business within the cruise sector, particularly during the summer months. Frommer's travel guide has named Royal Caribbean's Allure of the Seas as one of the Best Cruise Ships of 2011. Judges cited Allure and her sister Oasis of the Seas as, "undoubtedly the best entertainment ship at sea, with truly exceptional programming for both adults and kids." Judges were impressed by many aspects of the Oasis class ships, especially the innovations Royal Caribbean introduced on these vessels, "The biggest innovation is the vessels' split superstructures, with the top eight decks bisected lengthwise by a long canyon that contains an open-air garden and a boardwalk-like entertainment zone. Besides letting light and air into the center of the ship, this makes the whole vessel feel more 3D -- like you're walking the streets of a high-rise city, not shuffling blindly from one horizontal deck to another." The list of ships only surveyed ships in the Western Hemisphere, so ships in Europe and Asia were not included. In addition to taking the top honors, a few other Royal Caribbean ships made the "notables" list. Royal Caribbean's Radiance of the Seas, Brilliance of the Seas, Serenade of the Seas, and Jewel of the Seas were all mentioned for scoring highly. Judges enjoyed the Radiance class of Royal Caribbean ships because. "These four sisters combine sleek, seagoing exteriors with nautically themed interiors and acres of windows." Two Royal Caribbean passengers were arrested last week by U.S. Customs and Border Protection officers for allegedly smuggling heroin in a bag of shoes. When Serenade of the Seas arrived in San Juan, Puerto Rico, custom officers seized 3.5 kilograms of cocaine and 6.48 kilograms of heroin in two unrelated incidents. Officials nabbed Diana Hortencia Latigua-Lorenzo, 32, a U.S. citizen, and her brother, Breidy Latigua-Lorenzo, 20, a citizen of the Dominican Republic. The estimated street value of the heroin is $324,000 and the estimated value of the seized cocaine is $84,000. Nearly two dozen charitable organizations on the island of St. Croix received televisions from Royal Caribbean in a generous donation. The Royal Caribbean Twitter account announced that Mariner of the Seas, Radiance of the Seas and Serenade of the Seas had won the prestigious Port of San Francisco Environmental Gold Award. The annual award recognizes vessels for demonstrating “the strong environmental commitment of Princess Cruises in the areas of air emission reduction, waste water treatment, and recycling and disposal programs for solid waste.” This distinction is awarded by San Francisco’s Cruise Terminal Environmental Advisory Committee. The CTEAC operates the program to recognize cruise lines that are committed to environmentally responsible operations, include the deployment of ships using reduced emission system technology or cleaner-burning fuel. Royal Caribbean ships have long been proponents of environmental awareness and their ships have a number of "green technology" elements on board such as advanced wastewater purification systems, window tinting and operational conservation measures.